The mission of the Charles Drew Pre-Medical Undergraduate Mentoring Program is to encourage, support, and retain underrepresented minority undergraduates in the pre-med curriculum at Columbia University by providing one-on-one peer mentorship. 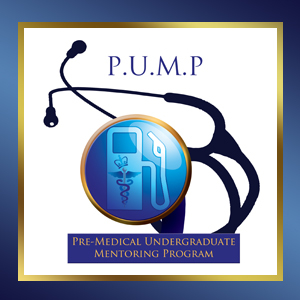 The Premedical Undergraduate Mentor Program (P.U.M.P.)?? ?is a new initiative started Fall 2009 sponsored by the Charles Drew Premedical Society and Social Justice Medicine (an auxiliary group of the Premedical Association of the Postbaccalaureate program) of Columbia University. The idea behind P.U.M.P. is to make use of peer resources to improve both recruitment and retention of historically underrepresented minority students in the premedical curriculum at Columbia University. In its first year, nineteen experienced upperclassmen premedical students and one post-baccalaureate volunteered to be P.U.M.P mentors. Mentors were paired with 20 freshmen and sophomores who expressed an interest via formal application for becoming P.U.M.P prot??g??es. Mentors and mentees are students from Columbia College, the School of General Studies, SEAS, and Barnard College.